ICEtrekkers Spikes Ice Cleats. Turn your shoes into a Zamboni, with ICEtrekkers Spikes. Excellent for navigating icy streets, parking lots and driveways, ICEtrekkers Spikes can be used with a variety of footwear and fit especially well over dress shoes. They are easy to put on and to take off, and stay on the footwear without the need for buckles or straps. 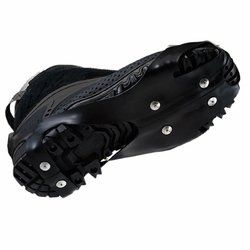 ICEtrekkers Spikes have 6-point contact on the ball and heel of the foot, providing grip even in glare ice conditions. Our spikes are made with tungsten carbide - the same tough steel used in high speed router bits. For added durability, the tungsten carbide tips are encased in an alloy steel housing. Great for town and country use. **For uninsulated boots, add one size to your numerical shoe size. For oversized insulated boots, add two sizes to your numerical shoe size.